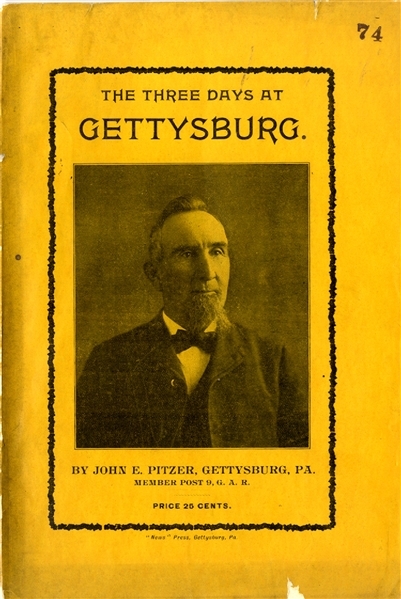 Booklet, 6” x 9”, “THREE DAYS AT GETTYSBURG : A COMPLETE HAND-BOOK OF THE MOVEMENTS OF BOTH ARMIES DURING LEE'S INVASION OF PENNSYLVANIA, AND HIS RETURN TO VIRGINIA : THE THREE DAYS BATTLE AT GETTYSBURG, JULY 1ST, 2ND AND 3RD, 1863 ; AND A GUIDE TO THE POSITION OF EACH” by John E. Pitzer, Member Post 9, GAR, 100pp., plus photo cover, VG. The guide is loaded with maps, photos and deep detail of the 3 day battle. nd, c 1900.